The app, which launched Wednesday, currently includes 1.7 million job listings. 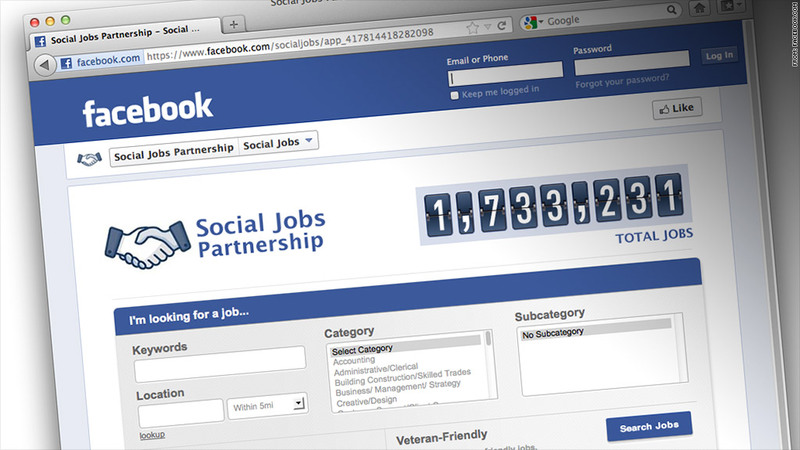 It's part of the Social Jobs Partnership initiative, which Facebook formed in October 2011 in conjunction with the U.S. Department of Labor and three nonprofit labor organizations. The Social Jobs App marks a shift for Facebook, which has historically focused on personal networking. LinkedIn (LNKD), which had about 187 million members as of September 30, has positioned itself as the king of professional networking. Investors were more upset about Monster helping to power Facebook's app, given that the company's bread and butter is its own job search site. Monster's stock closed down 5%. Facebook shares ended the day nearly 13% higher, but that jump came after about 800 million of the company's shares were made available to trade on Wednesday. Facebook's press release cited the flagging economy as the inspiration for the app. "When it comes to economic growth, few issues are more important than matching qualified candidates with great jobs. In that spirit, we know that the power of social media -- the connections between friends, family and community -- can have an outsized impact on finding jobs," Facebook (FB) wrote. Earlier this month, the Labor Department's monthly jobs report showed the economy added 171,000 jobs in October. But the unemployment rate inched up to 7.9%, from 7.8% in September. At launch, the Social Jobs App includes job listings from Monster (MWW), BranchOut, DirectEmployers Association, Work4Labs and Jobvite. Job seekers can search for positions based on industry, keywords and location. There's also a special filter for veteran-friendly jobs. Facebook touted its own ability to help in the recruiting field: About half of employers "are using Facebook in their hiring process," according to Social Jobs Partnership research, and 54% of those polled said they expect the social network will become a more important part of hiring in the future.